So now you finally have the remodeled kitchen you've been dreaming of and it's time to move all your stuff back in. Before you rush to get it all put away, take some time to make an organization plan. You want to store your items based on use; and if you've worked with a professional design/build firm you have probably already talked with them about this and have customized storage solutions built into your new kitchen. 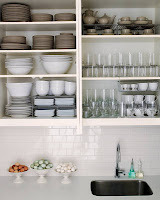 Here are some additional tips & tricks to help organize your kitchen, new or old! Store frequently-used objects in easy-to-reach locations. Notice what you use most often. Figure out where you will use them most. Infrequently used items, like the roasting pan that you only haul out during the holidays, can go on high shelves or in the back of cabinets. They can even be stored outside the kitchen in the garage, attic, basement, guest room closet, or a box under a bed. Food: Group food including spices, bottles and food storage containers in the cabinets just above your kitchen work station (the counter space you use to chop, need and mix). This way they can be easily accessed while prepping, chopping and mixing. Glasses and Dishes: Group these directly over either your dish washer or the drying rack for easy clean up. Cookbooks, Kitchen Towels, Tupperware: These items can go in your non-prime real estate areas because you won't be reaching for them as often at food and dishes. Appliances: Stored in the bottom cabinets just below your main work area for easy access during food prep. If you use an appliance daily, consider moving it to your counter top. Pots, Pans and Baking Sheets: Stored in the bottom cabinet, pans on their side to maximize space and pots nesting together. Lids should also be stored vertically. I like to rest mine in a larger, square Tupperware container. Mixing Bowls, Cutting Boards and Salad Spinners: As close to the drying rack or dishwasher as possible for easy clean up. Cleaning Supplies: In the bottom cabinet under the sink. Under the sink tends to be such an awkward space, it makes most sense to store bottles and spray in this tight spot. Finally, if you don't already have custom storage in your cabinets or pantry, here are some fantastic storage solutions you can find in stores and online that will vastly improve the use of your pantry and your kitchen! Perhaps the best investment you can make for your pantry is slide out (or "roll out" drawers). I like this extra deep model because it will fix stacks of mixing bowls, small appliances and even large ones like mixers and food processors, making them all much easier to retrieve. These containers are BPA-free, stackable, dishwasher safe, and square, making them very space-conscious. I use these in my own pantry and highly, highly recommend them. They make a wonderful gift for a bridal registry or housewarming as well. I rolled my eyes at this one until I thought of all the snack foods that go stale due to the bag not being sealed properly. For the chef who just doesn't have enough space, I love the industrial look of this kitchen shelving, which can easily be moved around your space to serve a variety of purposes: to store dishes, appliances, cookbooks, recipes, food canisters and more. I have to admit, I don't keep too much cereal around the house. As a carb addict, there's a very strong possibility I'd eat half the box in one sitting. However, these cereal boxes are a wonderful way to keep cereal fresh, and once again, the square shape makes these boxes very space-friendly. I will use these for grains like brown rice and quinoa, flour and other baking supplies, and small snacks like pretzels and nuts. Move your spices out of valuable shelf space and onto the inside of your pantry door with this spice rack. Normally, I'm opposed to buy sets but these three right-sized cubes fit my top three food storage requirements: they clear so you can see what you're storing, they are squared-shaped which makes them more space-saving and they are budget-friendly. Record the measurements as they are taken--people always think they will remember, but once you start looking at items you may confuse the sizes. Don't be a hero, record it on the spot.